From the Baylor Research Institute (N.M., B.L., R.S. ), Baylor Scott and White Health, Dallas, TX; Unit of Molecular Neurogenetics (A.N., D.G. ), Foundation IRCCS Institute of Neurology “Besta,” Milan, Italy; Mitochondrial Biology Unit (A.R. ), Medical Research Council, Cambridge, United Kingdom; Department of Bioinformatics (B.C. ), University of Texas Southwestern Medical Center, Dallas; and Department of Neurology (A.V. ), George Washington University School of Medicine, Children's National Health, DC. Objective: To investigate the genetic etiology of a patient diagnosed with leukoencephalopathy, brain calcifications, and cysts (LCC). Methods: Whole-exome sequencing was performed on a patient with LCC and his unaffected family members. The variants were subject to in silico and in vitro functional testing to determine pathogenicity. Results: Whole-exome sequencing uncovered compound heterozygous mutations in EARS2, c.328G>A (p.G110S), and c.1045G>A (p.E349K). This gene has previously been implicated in the autosomal recessive leukoencephalopathy with thalamus and brainstem involvement and high lactate (LTBL). The p.G110S mutation has been found in multiple patients with LTBL. In silico analysis supported pathogenicity in the second variant. In vitro functional testing showed a significant mitochondrial dysfunction demonstrated by an ∼11% decrease in the oxygen consumption rate and ∼43% decrease in the maximum respiratory rate in the patient's skin fibroblasts compared with the control. EARS2 protein levels were reduced to 30% of normal controls in the patient's fibroblasts. These deficiencies were corrected by the expression of the wild-type EARS2 protein. However, a further unrelated genetic investigation of our patient revealed the presence of biallelic variants in a small nucleolar RNA (SNORD118) responsible for LCC. Conclusions: Here, we report seemingly pathogenic EARS2 mutations in a single patient with LCC with no biochemical or neuroimaging presentations of LTBL. This patient illustrates that variants with demonstrated impact on protein function should not necessarily be considered clinically relevant. Next-generation sequencing has been successfully used in the identification of rare mutations in a number of genes causing many different white matter diseases and mitochondrial disorders.4 Particularly, mutations in the nuclear-encoded aminoacyl tRNA synthetase genes (ARSs) have been implicated in numerous mitochondrial disorders that cause white matter abnormalities.5 However, the explosive increase in rare genetic variants reported in the population in recent years has at times misrepresented the link between mutation and disease by incorrectly labeling many genetic variants as pathogenic.6 This is in part due to the lack of experimental validation of the pathogenicity of variants through functional in vitro or in vivo experimentation. Thus, clinical reporting of such variants is reliant on accurate information about the nature of the variant highlighting the importance of aggregated population databases for correct assessment of variant frequencies and the need for rigorous functional assays. As such, mitochondrial dysfunction can be ascertained through functional mitochondrial respiration assays, which are thought to be helpful in predicting DNA variant pathogenicity. However, functionally validated variants may not always be clinically relevant to the pathogenesis of the disease in question. This study was approved to use human subjects by the appropriate institutional review board. Biological samples from the patient and first-degree relatives were collected subsequent to written informed consent; ClinicalTrials.gov identifier: NCT00001671. It included a family consisting of 2 parents and their affected son and his 3 unaffected siblings. Each family member was subjected to whole-exome sequencing and genetic analysis. Briefly, libraries were constructed from genomic DNA of each family member using the Illumina TruSeq DNA Sample Prep methodology (Illumina, San Diego, CA), and exonic targets were captured using Illumina's TruSeq Exome Enrichment technology according to the manufacturer's protocols. 2 × 50 bp paired-end sequencing was performed on the Illumina HiSeq 2000. Sequence reads were aligned to the human reference genome hg19 using the Burrows-Wheeler Aligner v.0.5.9.7 PCR duplicates were marked and removed using Picard v.1.70 (broadinstitute.github.io/picard/), and local realignment, quality score recalibration, and SNP and INDEL variant calling were performed using the Genome Analysis Toolkit v.1.3.8 The variant calls were subsequently annotated by Annovar.9 The gene annotations were made against the RefSeq database, and known variants and allele frequencies were annotated with dbSNP 137, all ethnicities from the 1000 Genomes Project (April 2012, August 2015 release), the National Heart, Lung, and Blood Institute (NHLBI) GO Exome Sequencing Project (ESP, esp6500 release), and the Exome Aggregation Consortium (ExAC). Nonsynonymous variants were further annotated with pathogenicity prediction scores from SIFT,10 PolyPhen-2,11 LRT, and MutationTaster.12 Conservation scores from PhyloP, GERP, and PhastCons were provided by MutationTaster and Annovar. Multiple sequence alignments were performed with Clustal Omega in Uniprot (uniprot.org). Variant prioritization and candidate gene identification used an in-house workflow that stratified the variant annotation data and white matter disease association analysis with a recessive or dominant model of inheritance. The EARS2 variants were validated using Sanger sequencing. Genomic DNA was amplified using primers that targeted the variant location and subsequently sequenced using Applied Biosystems' BigDye Terminator v1.1 Sequencing Kit chemistry on a 3130xl sequencer (Applied Biosystems-Thermo Fisher Scientific, Waltham, MA). In addition, the EARS2 genes in 2 unrelated patients diagnosed with leukoencephalopathy, brain calcifications, and cysts (LCC) were Sanger sequenced using primers that spanned all 9 exons and exon-intron boundaries. PCR amplification was performed using HotStarTaq Master Mix (Qiagen, Hilden, Germany) according to the manufacturer's protocols. EARS2 primers are listed in table e-1 at Neurology.org/ng. Skin fibroblast cell culture and complementation studies. Primary skin fibroblasts from the affected patient and controls were cultured in 1× Dulbecco Modified Eagle Medium (Corning, Corning, NY) with 4.5 g/L glucose supplemented with l-glutamine and sodium pyruvate, 10% fetal bovine serum, and 1% antimyotic in a 25-cm2 flask. The medium was changed every 2 days until 90%–100% confluent, at which time the cells were trypsinized with 0.25% or 0.05% trypsin and washed with 1× phosphate-buffered saline (Gibco-Thermo Fisher Scientific) without Ca2+/Mg2+ then subpassaged to a 75 cm2 flask. Cultures were maintained in a humidified atmosphere at 37°C with 5% CO2. Fibroblasts were immortalized with pRNS-1 by transfection using Lipofectamine2000 (Invitrogen-Thermo Fisher Scientific) and selected by 100 μg/mL Geneticin G-418 (Gibco-Thermo Fisher Scientific).13 For complementation, wild-type (wt) cDNAs of EARS2 from a commercial clone (OCAAo5051A02110D) (Source BioScience, Nottingham, United Kingdom) were cloned into the pLenti6.2/V5 TOPOVector (Life Technologies-Thermo Fisher Scientific), and virions were obtained as previously described.14 Mutant and control immortalized fibroblasts were transfected with viral supernatant and selected upon exposure to 2 μg/mL Blasticidin (Life Technologies-Thermo Fisher Scientific). Fibroblasts and immortalized cells from patient and controls were trypsinized, pelleted, and solubilized in RIPA buffer with protease inhibitors; 50 μg of protein was loaded for each sample in 12% denaturing sodium dodecyl sulfate polyacrylamide gel electrophoresis. A rabbit polyclonal antibody against EARS2 (SAB2100641) (Sigma-Aldrich, St. Louis, MO) and a mouse monoclonal antibody against GAPDH (#MAB374) (Millipore, Billerica, MA) were used. Oxygen consumption rate (OCR) and maximum respiratory rate (MRR) were measured using a SeaHorse FX-96 apparatus (Agilent Technologies, Santa Clara, CA)15 in primary fibroblasts and immortalized fibroblasts in naive conditions and after transduction with wild-type EARS2 cDNA. A 6-year-old male patient born to healthy nonconsanguineous parents presented with a progressive encephalopathy consisting of intractable seizures, dystonia, chorea, and spasticity with severely impaired cognitive function. MRI (figure 1, A–D) and CT (figure 1E) showed diffuse white matter signal abnormalities and numerous calcifications throughout the brain in gray matter nuclei and juxtacortical U-fibers as well as the periventricular white matter, brainstem, the dentate nucleus of the cerebellum, and the subcortical white matter of both cerebral hemispheres. White matter abnormalities were observed through increased signals in the white matter in T2-weighted (figure 1C) and fluid-attenuated inversion recovery (FLAIR) (figure 1D) images and decreased signals on sagittal (figure 1A) and T1-weighted images (figure 1B). MR spectroscopy showed decrease in N-acetyl aspartate and no lactate peak. A number of large cysts were also present in the cerebellum and the supratentorial region (figure 1, A–D). Anatomically, lateral ventricles were enlarged with a missing septum pellucidum, atrophy of the corpus callosum, and basal ganglia volume loss. Routine laboratory testing revealed normal values and complete blood count. Extensive biochemical investigations were all normal except for a CNS folate deficiency from decreased concentrations of 5-MTHF of unknown cause. Muscle biopsy demonstrated a normal histopathology and mitochondria that were normal in number, distribution, and morphology with no mtDNA abnormalities. Cellular lactate-to-pyruvate ratio was normal in cultured skin fibroblasts. Skeletal muscle showed normal carnitine profiles and normal activity of the electron transport chain complexes I, II, III, and IV with citrate synthase at the upper limits of normal, which may indicate an increase in mitochondrial content. Glucose, lactate, and total protein were normal in the CSF. MRIs (A–D) and CT (E) indicate white matter signal abnormalities, cysts, and calcifications throughout the cerebral hemispheres. Diffuse cerebral white matter lesions are present, which is demonstrated by hypointense signals in the sagittal (A) and axial T1-weighted (B) images and the CT (E) and by the hyperintense signals in the axial T2-weighted (C) and axial fluid-attenuated inversion recovery (FLAIR) images. The CT (E) shows extensive calcifications in the subcortical white matter and along the periventricular white matter. Large cystic lesions can be seen along the quadrigeminal plane and parieto-occipital regions (B–D). Exome sequencing and genetic analysis. Whole-exome sequencing generated an average of 3.2 Gb of sequence and 61–73 million reads per individual that mapped uniquely to the genome with a mean sequence coverage of 26×. LCC is an assumed autosomal recessive disorder due to the occurrence of sibling pairs, which include females, but variants following both an autosomal recessive and autosomal dominant inheritance pattern were interrogated. Following a candidate gene prioritization and filtering strategy that enriched for rare (minor allele frequency [MAF] of <1%) nonsynonymous exonic/splice variants that both segregated in a recessive or dominant manner and may or may not be associated with white matter disease pathogenesis, only 2 recessive variants in the EARS2 gene segregated in a compound heterozygous manner, c.328G>A (p.Gly110Ser) and c.1045G>A (Glu349Lys). No other obvious exonic or splice variants were observed. The presence or absence of the 2 variants and their segregation within the family were validated with Sanger sequencing (figure e-1). The patient was compound heterozygous for the 2 variants, the mother was heterozygous for the c.328G>A variant, and the father was heterozygous for the c.1045G>A variant. Two of the siblings were heterozygous for either variant. Sanger sequencing of the exon and exon/intron boundaries of EARS2 in 2 unrelated patients with LCC revealed only common polymorphisms and no rare mutations. In silico analysis of EARS2 variants. The EARS2 variants were analyzed in silico to determine the MAF within the population, predicted pathogenicity, and evolutionary conservation. The c.1045G>A nucleotide resides in exon 5 of EARS2 in the anticodon binding domain, resulting in a missense amino acid change from a large acidic negatively charged glutamic acid to a large positively charged basic lysine at residue 349 (Grantham Score: 56). It was present at low frequencies in 1000 Genomes (MAF 0.10%), ESP (MAF 0.18%), and ExAC (MAF 0.13%). It was also present in dbSNP (rs#187662524). The variant was predicted as benign by PolyPhen-2, damaging or disease causing by SIFT and MutationTaster, and neutral by LRT. This position is conserved according to GERP, PhyloP, and PhastCons. The c.328G>A nucleotide change resides in exon 3 in the catalytic domain of EARS2, resulting in a missense amino acid change from a small polar glycine to a small polar serine at residue 110 (Grantham Score: 56). It was not present in the 1000 Genomes, but it was present at low frequencies in the ESP (MAF 0.03%) and ExAC (MAF 0.04%) databases. It was also present in dbSNP (rs#201842633). Pathogenicity prediction programs considered this variant as damaging/disease causing by SIFT, PolyPhen2, MutationTaster, and LRT. GERP, PhyloP, and PhastCons also predicted high conservation at this position. Biochemical/protein studies on patient's fibroblasts. Skin fibroblasts from the proband were analyzed to evaluate the effect of the identified EARS2 variants. The total amount of EARS2 protein detected by Western blot analysis was reduced to 30% in the patient's fibroblasts compared with controls (figure 2A). Oxygen consumption, which depends on and reflects the cumulative proficiency of the whole set of mitochondrial respiratory chain complexes, was measured. Significant reductions of both OCR and MRR, indicating reduced electron flow through the respiratory chain, were observed (figure 2B). These alterations were also confirmed in patient-derived immortalized fibroblasts (figure 2, C and D), which were then used for complementation through transduction of wild-type EARS2. 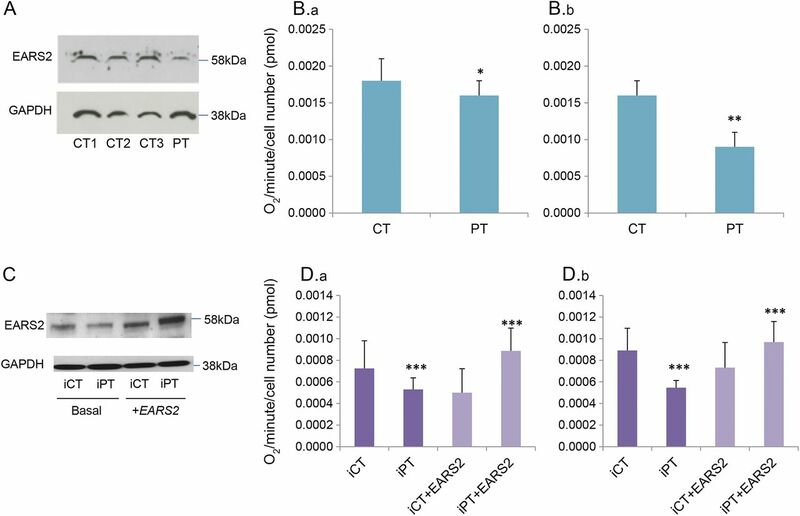 Overexpression of EARS2 protein in both control and mutant transduced cells (figure 2C) was associated with the recovery of defective respiratory parameters (OCR and MRR) to normal values (figure 2D). (A) EARS2 protein amount in the patient's (Pt) and control (CT1, CT2, and CT3) fibroblasts, obtained by Western blot using an anti-EARS2 antibody. An anti-GAPDH antibody was used as a loading control. (B) Oxygen consumption analysis in the patient's (Pt) and control fibroblasts. Histograms show OCR (B.a and D.a) and MRR (B.b and D.b). OCR and MRR values (mean of 6–8 replicates) are expressed as picomoles of O2 per minute and normalized by cell number. p value obtained with 2-tailed Student t test, *p < 0.05; **p < 0.01. (C) EARS2 protein amount in the patient's (iPt) and control (iCT) immortalized fibroblasts, in basal conditions and after transduction with wt EARS2 (+EARS2); Western blot analysis was performed as described in A. (D) Oxygen consumption analysis, as reported in B, performed in patient's (iPt) and control (iCT) immortalized fibroblasts, in basal conditions and after transduction with wild-type EARS2 (+EARS2). ***p < 0.001. MRR = maximum respiration rate; OCR = oxygen consumption rate. Axial T2-weighted (A–C) and T1-weighted (D) MRIs demonstrate T2-hyperintensities and T1-hypointensities respectively, indicating lesions in the deep cerebral white matter and periventricular white matter with sparing of the periventricular rim. Signal hyperintensities are also present in the thalami (B) and dorsal part of the midbrain (C). Modified from reference 18. LTBL = leukoencephalopathy with thalamus and brainstem involvement and high lactate. Conversely, LCC is strictly a neurologic disorder limited to the CNS and consisting of a cerebral microangiopathy resulting in presumed tissue hypoxia, which leads to microcystic and macrocystic parenchymal degeneration with white matter changes secondary to brain edema rather than primary demyelination.16,17,21 MRI of the patient was consistent with LCC and not LTBL. The patient's pathology was also consistent with LCC including angiomatous-like rearrangements of microvessels with secondary degeneration of cellular constituents such as gliosis and aggregates of intermediate filaments called Rosenthal fibers,16,22 none of which are known to be found in LTBL. LCC and LTBL have strikingly different neuroimaging and pathologic features, suggesting that EARS2 is not involved in the pathogenesis of LCC. However, functional studies on the LCC patient's fibroblasts clearly demonstrated a mitochondrial dysfunction due to abnormal mitochondrial respiration with significantly decreased MRR and OCR and decreased EARS2 protein levels suggestive of a pathogenic role of the EARS2 variants; nonetheless, LCC does not present with mitochondrial abnormalities. Abnormal mitochondrial respiration and decreased protein levels as seen in this patient have both been confirmed in other patients with LTBL.18,19,23 Patients with LTBL have seen up to a ∼70% decrease in the MRR,18 and our patient showed a less severe but still a significant decrease of ∼43% in the MRR. Despite these abnormalities, increased lactate, which is a hallmark of LTBL and a consequence of pathogenic EARS2 mutations,18,19 was not seen in MR spectroscopy or body fluids in the present patient with LCC. Recently, mutations in the SNORD118 gene located in the 3′ UTR region of the TMEM107 gene were identified in the pathogenesis of LCC.24 SNORD118 encodes the box C/D snoRNA U8 important for ribosome biosynthesis. In that publication, family member 1A from family F278, which was this study's patient with LCC, was found to have compound heterozygous mutations in SNORD118: a novel n.75A>G mutation and a very rare n.8G>C mutation. The presence of the SNORD118 mutations as the pathogenic driver of LCC relegates the functionally pathogenic EARS2 variants in this case to an unknown status; however, EARS2 as a genetic disease modifier or the additional presence of protective alleles from defective EARS2 cannot be ruled out. The absence of a clear LTBL phenotype in a patient with apparent functionally validated pathogenic EARS2 variants, and the presence of other pathogenic variants (i.e., SNORD118 mutations) strongly associated with the patient's phenotype, throws doubt on our ability to infer the clinical pathogenic effect of a variant through in vitro experiments. According to the standards and guidelines for the interpretation of sequence variants set in place by the American College of Medical Genetics and Genomics (ACMG),20 the EARS2 variants are considered pathogenic on their own and should be labeled as such in clinical reports. The functional assays indicating mitochondrial dysfunction through respiration defects as presented in this study are typically sufficient to demonstrate clinical relevance of EARS2 variants18 and other variants in mitochondrial-related genes.25,26 It is important that this indicates that one cannot simply always assume that putative functionally damaging variants ascertained from in vitro experimentation are clinically relevant. In vitro observations about the deleterious effects of a given variant on biochemical functionalities do not necessarily translate to in vivo pathogenicity or strict clinical causality; a second, possibly more relevant, genetic or epigenetic factor should always be taken into account, especially for cases with previously unreported genotype/phenotype correlations. This further complicates the pathogenic validation of rare genetic variants and their role in disease, underscoring the need for more robust and precise validation methods. N.H.M. conceived and designed the study and experiments; performed sample preparation; performed bioinformatics and statistical analysis of sequence data; performed bioinformatics analysis of EARS2 variants; performed mutation analysis and Sanger sequencing; performed fibroblast cell culture; drafted the manuscript; and edited the manuscript. A.N. performed cell culture, Western blot, and Seahorse assays and analyzed data. AR performed the immortalization. B.L. performed sample preparation and whole-exome sequencing. B.C. performed bioinformatics analysis of sequence data. A.V. acquired and assessed the patient; provided an additional patient for Sanger sequencing; and edited the manuscript. R.S. conceived and designed the study and experiments; acquired and assessed the patient; and edited the manuscript. D.G. conceived and designed the study and experiments; analyzed the Seahorse data and Western blot data; and edited the manuscript. Funding provided by the Baylor Scott & White Healthcare Foundation. N. McNeill, A. Nasca, A. Reyes, B. Lemoine, and B. Cantarel report no disclosures relevant to the manuscript. A. Vanderver has served on the scientific advisory board of Shire Pharmaceuticals; has received travel funding/speaker honoraria from Hunter's Hope (family foundation for Metachromatic Leukodystrophy), United Leukodystrophy Foundation, Metachromatic Leukodystrophy Foundation, and European Leukodystrophy Foundation; holds a patent (pending) for Sialic acid measurement in CSF in the diagnosis of Vanishing White Matter disease; has been an unpaid consultant for Stem Cells Inc.; and has received research support from Pennsylvania Department of Health, Frontiers in Leukodystrophy Initiative (FrontLINe), NIH, H-ABC Research Fund, Calendar Research Contribution Fund, H-ABC Research Fund, and Aicardi-Goutieres Syndrome Research Fund. R. Schiffman has served on the scientific advisory boards of and has received travel funding/speaker honoraria from Protalix Biotherapeutics and Amicus Therapeutics; holds the following patents: Triheptanoin diet for Adult Polyglucosan Body Disease (APBD), Use of tetrahydrobiopterin as a marker and a therapeutic agent for Fabry disease (3), Urinary triaosylceramide (GB3) as a marker of cardiac disease, and Gene encoding a new TRP channel is mutated in mucolipidosis; has been a consultant for Gerson Lehrman Group Councils and Guidepoint Global; has served on the speakers' bureau of Genzyme Corporation; and has received research support from Protalix Biotherapeutics, Amicus Therapeutics, and Baylor Research Foundation. D. Ghezzi has served on the editorial board of Orphanet Journal of Rare Diseases; and has received research support from the Italian Ministry of Health, European Communities, Foundation Telethon, CARIPLO Foundation Italy, and Pierfranco and Luisa Mariani Foundation of Italy. Go to Neurology.org/ng for full disclosure forms. The authors thank the study subjects for their participation and consent. They also thank Dr. Marjo van der Knaap for providing an additional patient for Sanger sequencing. Accepted in final form April 18, 2017.
. Case definition and classification of leukodystrophies and leukoencephalopathies. Mol Genet Metab 2015;114:494–500.
. Update on leukodystrophies: a historical perspective and adapted definition. Neuropediatrics 2016;47:349–354.
. Whole exome sequencing in patients with white matter abnormalities. Ann Neurol 2016;79:1031–1037.
. Aminoacyl-tRNA synthetases in medicine and disease. EMBO Mol Med 2013;5:332–343.
. Efficient transfer of cloned DNA into human diploid cells: protoplast fusion in suspension. Mol Cell Biol 1984;4:2549–2552.
. Down-regulation of CXCR4 expression by SDF-KDEL in CD34(+) hematopoietic stem cells: an anti-human immunodeficiency virus strategy. J Virol Methods 2009;161:30–37.
. Microscale oxygraphy reveals OXPHOS impairment in MRC mutant cells. 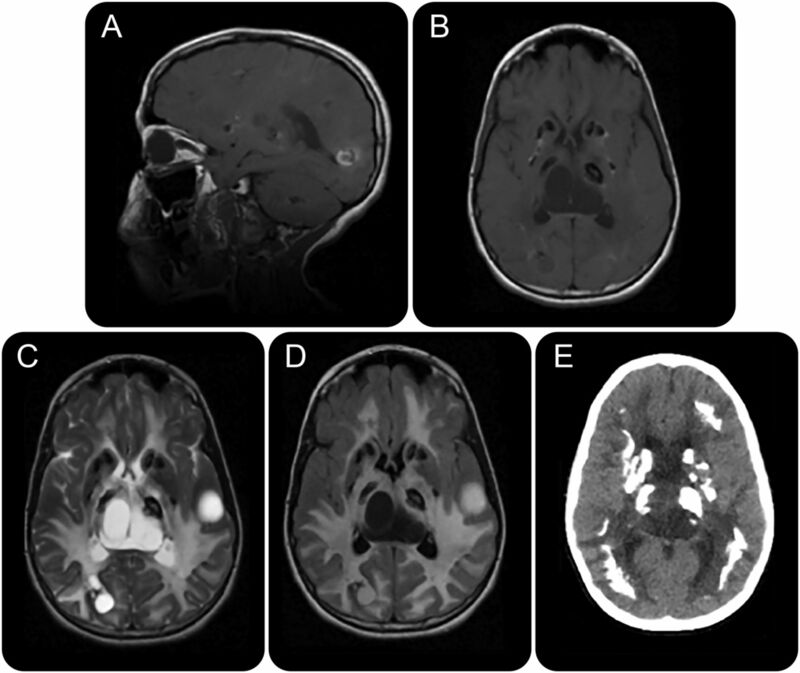 Mitochondrion 2012;12:328–335.
. Extensive brain calcifications, leukodystrophy, and formation of parenchymal cysts: a new progressive disorder due to diffuse cerebral microangiopathy. Neurology 1996;46:1297–1301.
. Late-onset leukoencephalopathy with cerebral calcifications and cysts: case report and review of the literature. BMC Neurol 2016;16:19.
. Leukoencephalopathy with thalamus and brainstem involvement and high lactate “LTBL” caused by EARS2 mutations. Brain 2012;135:1387–1394.
. EARS2 mutations cause fatal neonatal lactic acidosis, recurrent hypoglycemia and agenesis of corpus callosum. Metab Brain Dis 2016;31:717–721.
. Leukoencephalopathy with calcifications and cysts: a purely neurological disorder distinct from coats plus. Neuropediatrics 2014;45:175–182.
. An adult case of leukoencephalopathy with intracranial calcifications and cysts. Neurology 2006;67:1890–1892.
. Lethal neonatal LTBL associated with biallelic EARS2 variants: case report and review of the reported neuroradiological features. JIMD Rep 2017;33:61–68.
. Mutations in SNORD118 cause the cerebral microangiopathy leukoencephalopathy with calcifications and cysts. Nat Genet 2016;48:1185–1192.
. Mutations of the mitochondrial-tRNA modifier MTO1 cause hypertrophic cardiomyopathy and lactic acidosis. Am J Hum Genet 2012;90:1079–1087.